I have been in the refugee camps and seen disabled people with no way of moving/ travelling. I have been with groups who had to buy wheelbarrows to put old and injured people in. I have found a company in Athens who can supply wheelchairs to groups I am helping in Chios Island and Samos Island. For Chios I will send to UNHCR contacts and for Samos it is to a grassroots group of volunteers. As soon as I have the funds I will buy 12 wheelchairs, 6 for each destination and get them there straight away. Imagine being disabled, leaving your wheelchair on the shores of Turkey, getting in a boat that may capsize/sink – thinking what will happen to you. Then you make it alive and you have no way of going anywhere or moving. Just found this website I heard about on the radio today. It sells the joggings bottoms and trainers we so badly need for refugees and everything is, as the name suggests, £5. Shazia Malik has been in Slovenia trying to go see the camps, and more importantly the areas outside the camps where are people waiting. She had been working on getting permission from the Red Cross for us to buy a 12m industrial tent or two to get some sort of system and shelter in place. However from Wednesday it was hoped that everyone could be accomodated inside the camp. The relief plan was to relocaye everyone by train to Sentijl at the Austrian border. Shazia therefore decided to make her way there to see if our assistance is required there. By Thursday night/ early Friday morning Shazia had managed to convince the officials to allow them to serve food to people who had been waiting on the border. With this agreed she started working on implementing some kind of system at the border crossing so people are warm, dry and have food and drink. Jane and Faz arrived in Slovenia on Sunday where they were planning to join Shazia. However Shazia had to rush up to Vienna with another charity with a van full of food as reports were coming through about 1500 refugees waiting and needing food. For more updates on Slovenia see the blog post ‘Jane’s facebook updates’. 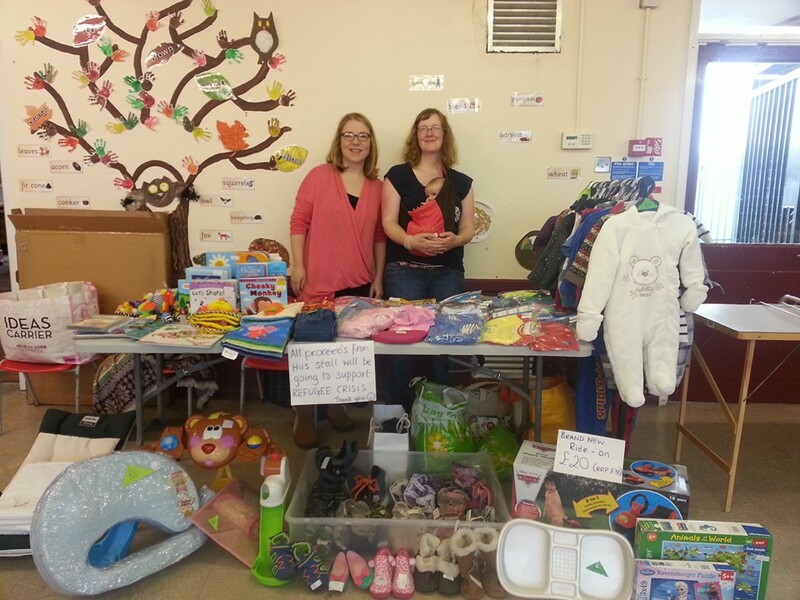 The Garden Village Playgroup ‘nearly new’ table top sale on Saturday the 31st October raised £50, which will pay for 185 pairs of baby gloves for Tabanovtse which are desperately needed. Thanks to Elinor Doherty and Donna Madeleine Shepherd for your hard work on the day!